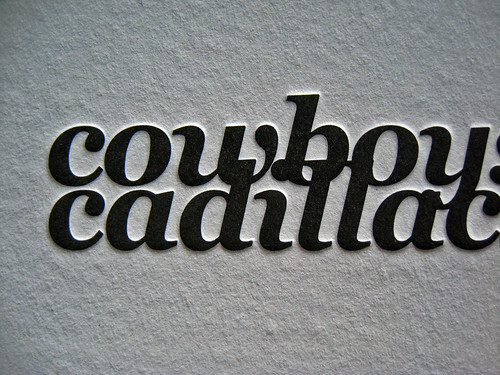 Cowboys & Cadillacs, need we say more? Black ink on white paper creates a clean crisp look. 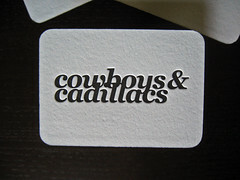 Stacey Joslin is the creator of Cowboys & Cadillacs, a lifestyle blog that reports on interior design, fashion, music, and more. 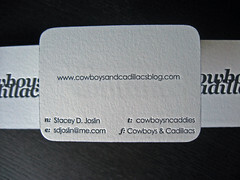 We printed these business cards for Stacey to use as a consultant for interior design, home/office organization, event planning, baking, and all the other great things she does. 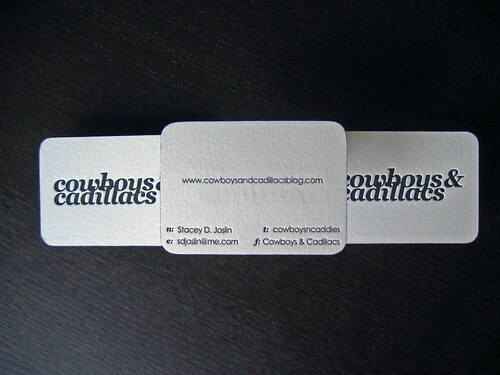 The business cards are an unusual size, 3.5″ x 2.5″. Because they’re taller than a normal card, they definitely have some heft to them. 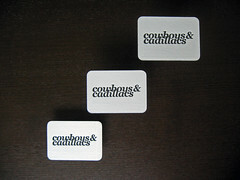 The nice thing is that they can double as a coaster. 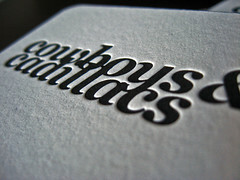 The cards were printed on Crane’s Lettra fluorescent white stock (220lb). Stacey supplied the design for the cards. 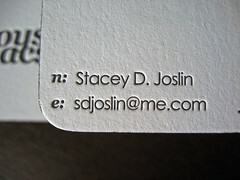 We used black ink on both sides, the logo on the front and Stacey’s contact information on the back. 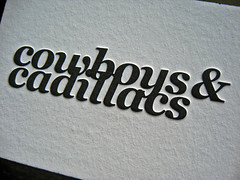 Black was the perfect choice for the logo which was designed with Georgia Bold Italic. Georgia has a special place in our hearts, at any size its playful and appealing while being really easy to read. FUN FACT: Georgia was designed by Matthew Carter in 1993 for Microsoft as the serif companion to sans-serif Verdana. 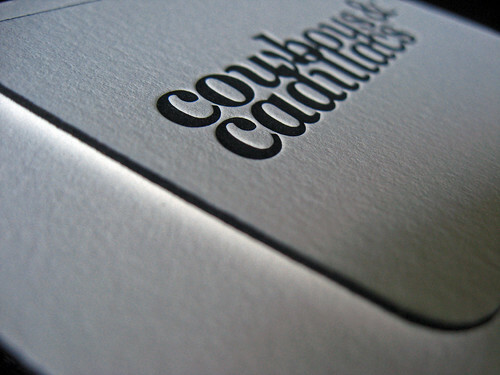 The front was printed second to ensure a nice uniform impression of the C&C logo. 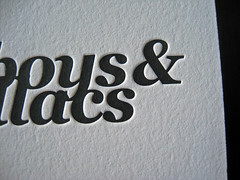 The bold ampersand is really interesting, is it just me? 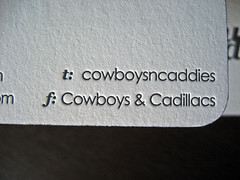 It’s one of the first things I look at in a font, and I love this one. Since the design for the front and back didn’t overlap too much we were able to print it on pre-duplexed 220lb stock. 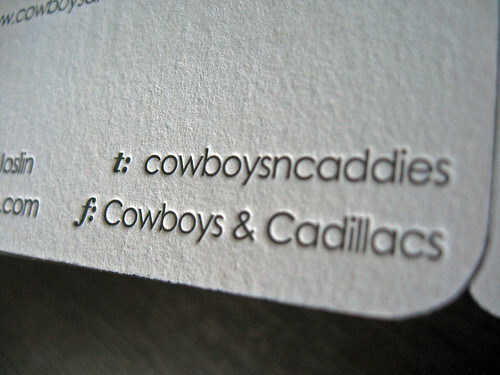 The cards were finished by rounding the corners with a 1/4″ die. 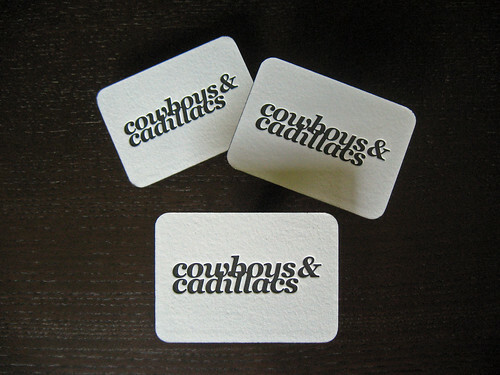 The round corners help compliment the smooth curves of the logo softening the appearance of the whole card. The last touch we added were black edges. 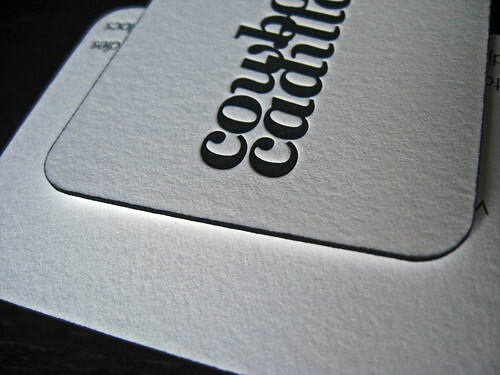 Edge coloring these cards in black seemed like the only option to match the contrast of the ink on paper. Don’t take the black edges lightly, they are only for the bold and daring! 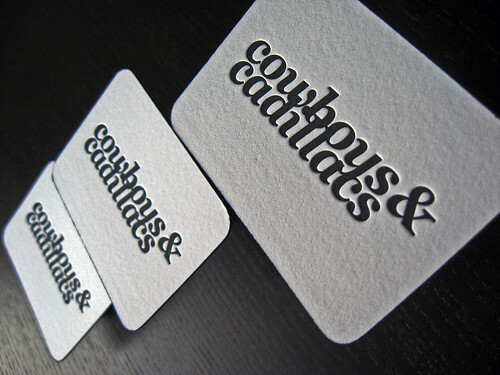 To get a quote on a custom business card, email us with the specs, we’d be happy to give you a quote.